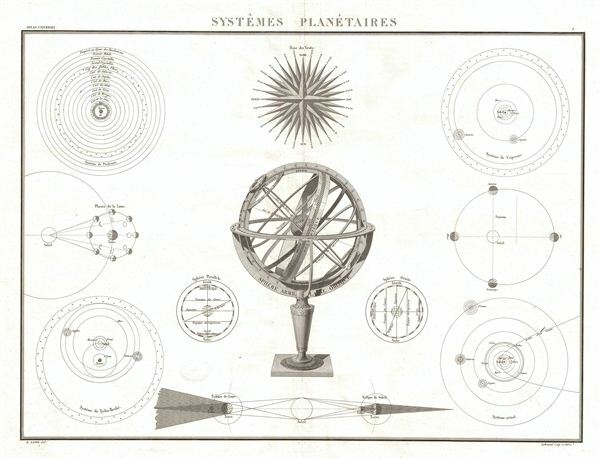 A fine first edition example of M. Lapie's 1829 chart of the planetary systems. This beautifully engraved chart consists of eleven astronomically themed elements including a large central armillary sphere, a map of the Ptolemaic Universe, an illustration of lunar phases, a illustrations of Tycho-Brahe's planetary theory, a large wind rose, an eclipse chart, a map of the seasons, an illustration of the Copernican Universe, and an illustration of the actual solar system, among others. engraved by Armand Joseph Lallemand as plate no. 1 in the first edition of M. Lapie's important Atlas Universel. This chart, like all plates from the Atlas Universel features an embossed stamp from the Lapie firm.